The LG DLG5002W Ultimate Dryer has made laundry more streamlined because such technology has eliminated the need to iron clothes or put them through another drying cycle. It automatically adjusts drying time according to the moisture content of each load. The FlowSense Duct Clogging Indicator will ensure clog free drying. Receive a notification when clogs have formed and need to be removed. And with the Sensor Dry System, the dryer would automatically turn itself off when one cycle is through and thus save electricity. The LG DLG5002W has a capacity of 7.3 cu. ft. that allows handling of huge loads of laundry. Dry clothes a little less often than with older models. This will save time and energy, giving consumers the chance to focus more on other aspects of life. Clogging is the number one reason most dryers don't work as efficiently as promised. The LG DLG5002W on the other hand, is equipped with FlowSense Duct Clogging Indicator technology that indicates when ducts need to be cleaned out already. The LED Display indicators and Dial-A-Cycle controls eliminate the need to estimate and guess while doing the laundry. With such technology, the right settings are sure to be achieved every time. There are 12 Drying cycles users can choose from: Anti bacterial, Sensor dry, Heavy duty, cotton/normal, bulky/bedding, towels, delicates, small load manual dry, sportswear, air dry, speed dry and freshen up. The top plate and cabinet of the LG DLG5002W dryer is painted steel which guarantees rust-free equipment that you can use for a long time. Aside from this, the exterior could blend in with any home decor because of its modern look. The door rim is made of chrome and the door glass is transparent, allowing you to check on your clothes from time to time. 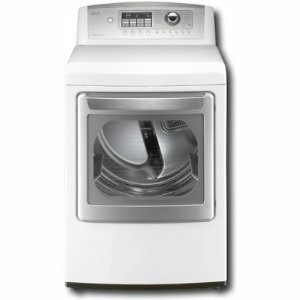 The dryer uses state-of-the-art controls with knobs and touch pads that allows the user to set his or her preferred settings and options. Ensures efficient drying with its FlowSense Duct Clogging Indicator technology. Be notified when your ducts need de-clogging before it permanently damages your appliance. LED Display indicators and state-of-the-art electrical controls will do the job for you. All you need to do is to load, set and remove the clothes after each cycle. The LG Dryer can ensure a longer lifespan because of its chrome and steel painted parts. Keep your appliance in the family for longer. There are too many cycle programs to choose from and it may not be economical for consumers who need it only for home-use. Basic settings may be enough. Buying one can be heavy on the pockets of average consumers.